The Faulkes project owns two research quality telescopes. One is located on Maui, Hawaii (Faulkes Telescope North) and the other is located in Siding Spring, Australia (Faulkes Telescope South). Each 23 tonne telescope stands 8 metres tall and has a 2 metre diameter primary mirror and a field of view up to 30 arcminutes in diameter. The whole telescope system is designed to operate automatically by remote control. All that is needed to control one of the telescope is a PC and an Internet connection. A control centre in the UK (and others in Hawaii and Australia) will send instructions from the user via the Internet on which observations are to be carried out. 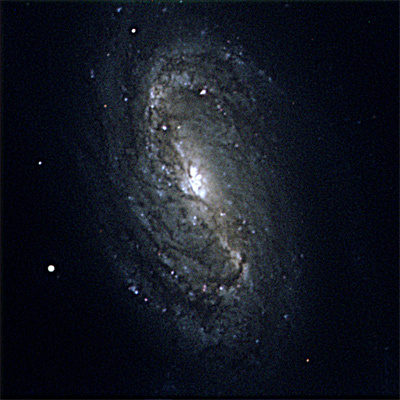 The robotic nature of the telescopes means that excellent images of astronomical objets are sent within minutes to the user's PC via the Internet. Faulkes Telescope North was used during 7 half our sessions at the Going Nova science event in Forres on 10, 11 and 12 November 2005 by a team of amateur astronomers consisting of Bill Leslie (Sigma), Alan Tough (Sigma), Pauline Macrae (HAS), Rob Nuttall (HAS) and Eric Walker (HAS). The Faulkes project is funded by Dr Martin "Dill" Faulkes and other agencies. 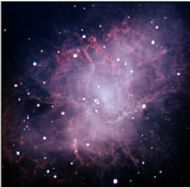 The picture seen here of M1, the famous Crab Nebula, is a preview of the sort of images that may be produced by the Faulkes Telescope imaging team at the forthcoming Going Nova event on Saturday 12th November. 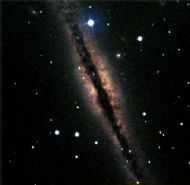 The image was taken remotely, using the 2m Faulkes telescope in Hawaii, by Bill Lesley of SIGMA. The FITS images were then processed by Eric Walker of HAS using the Photoshop 'FITS Liberator' plug-in software. This makes the image a true SIGMA/HAS collaboration- hopefully the first of many! 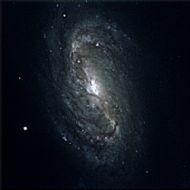 Great image of M97 in Ursa Major. 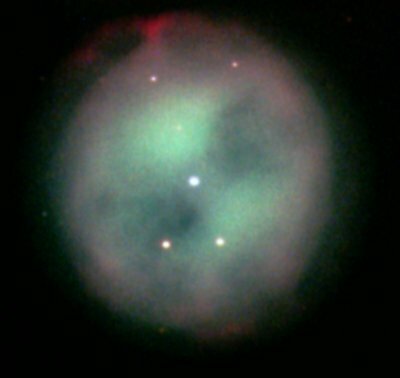 Known as the 'Owl Nebula' because of its distinctive similarity to the face of an owl, M97 is a planetary nebula with a 16th magnitude central star- here easily captured by the Faulkes telescope in Hawaii. The image was captured and processed by Bill Leslie at the Going Nova science event on Saturday 12th November. This is the first 'finished' image from the selection that were taken by the imaging team at the Going Nova event at Forres, Saturday 12th November. It was processed by Eric Walker using Adobe Photoshp CS with the FITS Liberator plug-in. A stunning image of this face-on spiral galaxy in Leo. It is easy to make out the dust lanes in this image, taken using the remotely controlled 2m Faulkes Telescope North in Maui, Hawaii. A beautiful edge-on spiral galaxy in Andromeda, NGC891 clearly shows its dust-lane in this image taken by the Faulkes telescope imaging team on Saturday 12th November. 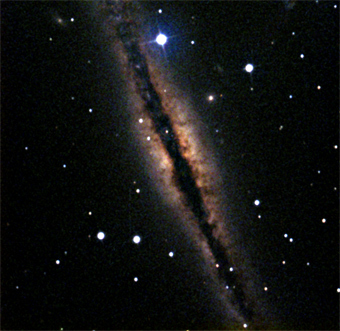 NGC891 is often overlooked as an observing object, due to nearby M31 being easier to find. Final processing of the image was done by Eric Walker using Photoshop Cs and the FITS plug-in programme.